Kathia grew up in beautiful Costa Rica where plantains grow on trees and kids run and play outside. I’m lucky she chose me as a friend. Not only is she fun, intelligent, creative, and incredibly loyal, (she’s always the first to defend me), but she shares her childhood recipes too! I think it was while we were sitting in a Cuban restaurant in Manhattan that she told me about this gorgeous, simple, delicious soup. 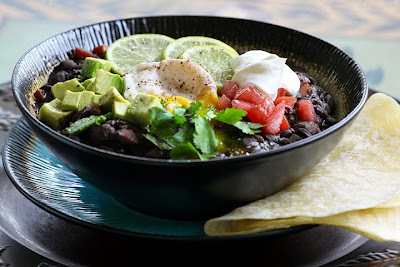 It’s one of those busy day recipes, as Kathia tosses the black beans into the slow cooker before work and finishes the soup when she arrives home. If I was in Costa Rica I’d be adding chopped plantains to the beans, but since my access to decent plantains is zero, I used carrots to sweeten the deal. If you find quality plantains, using them will make this more authentic. Kathia I am so grateful to have you as my friend! Thank-you for this terrific staple recipe. With this method you won't need to soak the beans overnight. 1. Rinse beans well in a colander, then spread out on a baking sheet and sort out any rocks or bad looking beans. Place the beans in a slow cooker, and the garlic clove, and cover with hot water. Do not salt the beans at this point or the skins will get tough. 2. Cook on low heat for 5 to 6 hours. Test for doneness. Turn off the heat and add the salt. Let the beans rest until you’re ready to start the soup. For a hearty vegan meal, skip the egg and sour cream garnish. 1. Warm the olive oil in a large pot over medium high and add the onion, carrots, bell pepper, sea salt, pepper, garlic powder, and onion powder. Stir to combine and cook stirring occasionally until the vegetables are tender and the onions start to brown. About 10 to 15 minutes. 2. Add the water to the pot and deglaze the bottom of the pan. Meanwhile puree 2 cups of the black beans with the garlic clove they were cooked with. Add the puree and the rest of the black beans with their liquid to the soup pot. Cook stirring often until bubbly. 3. Carefully crack the eggs into prep bowls, one per prep bowl. Then slide eggs gently into the soup pot and cover with a lid. Cook for a couple of minutes until the egg whites solidify but leave the yolks runny to taste. 4. To serve, scoop up the beans with an egg into individual bowls. Garnish as desired and serve with tortillas. Recipe adapted slightly from Kathia Castro from Pink Little Cake. Picture by Laura Flowers. This looks like a great protein packed vegetarian meal with lots of good flavor. What an interesting recipe! It looks delicious, and I love all of the toppings that you added. Wow. This is something I never would have put together in my head but it looks amazing! Laura, you are so sweet. Thank you so much for getting me good memories from Costa Rica, your words are awesome. The soup is delicious, as you already know. I am also bless to have you as a friend. mmm. I am thinking about or dinner at Victor's! This soup looks fabulous! I love everything in it! YUM! Laura what a great friend you have. The two of you are so blessed to have each other. The soup sounds wonderful! It reminds me of my Mom's Black Bean Soup with homesmade tortilla's. It puts a smile on my face. Lovely soup with egg and black beans..
come sempre una ricetta meravigliosa!! ciao! This looks delicious and healthy! Yum! My husband and I were in Costa Rica in college and we had something yummy like this every day. This brings back some great memories-delicious recipe! What an awesome friend you have! I love black bean soup and using the crock pot to make it is a great idea. Love the blog, love the pic, hate the recipe! It's just that egg on top that gets me--can't do it, girl! Love you. Please forgive me! Did you like the egg on top? I loved the egg on top, but I adore runny eggs. Dishboy Scott is terrified of runny eggs and had his egg free. I made fun of him the whole time of course lol. I love this kind of meal, so full of wonderful flavors. The egg on top is perfect, and all those delicious toppings...yum. Laura, this is my kind of meal. Thanks so much for posting this. How delicious it sounds and love that it is made in a crock pot for busy people! Wow, this is a huge improvement over simple, slow cooked black beans, which I rely on A LOT, but it's still easy enough that I can focus on the bane of my existence (grading). Kudos to Kathia, I'm trying this next week! Laura, thank you posting this as I sit down to write my grocery list. We will notify you when we re-post your recipe. Looks delicious! Gorgeous photo Laura! I love all the flavors in this recipe. In fact I just made a Southwest salad that I haven't posted yet that is very similar to what goes into this. Black beans are one of my favorites... Never thought to use a slow cooker, though. Brilliant! Beautiful pics...but then so r all the other pics on your blog...that is an aaweso me talent you have there...keep posting!! Even with the black beans, this has to be one of the most beautiful soups I've seen! It looks so colorful! I'm glad your friend shared the recipe with you. Your soup looks quite terrific!! I so love black beans!! This is my kind of meal. I love soup loaded with other flavorful and healthful items like that-the egg is really decadent sounding too! I love bean soups - hearty, healthy, easy on the wallet. The egg component is new to me, and I can't wait to try it. Well, this is a treat, my dad spends most winters in Costa Rica, and he loves the food. This is a keeper for next time i go to visit him! Love the egg. perfect! Your black beans photos are amazing and recipes sounds decent enough for a try. I have a post on how to make black beans from scrath without any seasoning at http://desigrub.com/2010/03/glorious-black-beans/ > Let me know if you find it useful. This was a great soup! Thanks for the recipe and photographic inspiration! FYI, I cooked my egg until is was no longer runny because I don't like eating snot (haha), and I think the addition of some cilantro was really important. Katie I'm so glad you enjoyed it! Kathia will be really happy to hear this! Wow, this dish looks absolutely delicious!! I'm always looking for good crockpot meals and am so happy I stumbled upon your website! Once you are in Costa Rica you will relish on the best cuisines in the world. The Typical cuisine of Costa Rica is Tipico, a vegetable beef soup.Dishes like the verduras, tamales, sopa negra, gallo pinto are one of the favorites in Costa Rica. This dish looks really great.